Cradle Mountain Lake St Clair Walk - 6 Day Self Guided - Pack-Free! Part of the World Heritage–listed Tasmanian wilderness, the Cradle Mountain Lake St Clair National Park incorporates glacier-sculpted mountain peaks, river gorges, lakes, tarns and tracts of wild alpine moorland. Few places in the world offer such pristine scenery and diverse hiking options. It’s a paradise for photographers, wildlife and outdoors enthusiasts, but, most of all, it’s a haven for walkers. Just as importantly it’s a haven for those who prefer a little bit of luxury so you can put your heavy backpack and tent aside and enjoy staying in comfort, eating chef-prepared meals whilst comprehensively exploring this area one step at a time. Filling a valley carved out by ice during several glaciations over the last two million years, Lake St Clair is the deepest lake in Australia and the headwaters of the Derwent River. It is ringed by some remarkable mountain peaks which are covered in snow for much of the year. It is also the end point for those bushwalkers tackling the Overland Track which runs between Lake St Clair and Cradle Mountain. We will walk the northern and southern-most sections of the world famous Overland Track through the Tasmanian Wilderness of Cradle Mountain-Lake St Clair National Park, plus some of the best of Tasmania’s Great short walks of this region. We have included the iconic Cradle Mountain walks including the Face Track and Dove Lake as well as many other hikes. Ancient rainforests and alpine heaths, pine-fringed glacial lakes and icy streams that cascade down rugged mountains make the walks at Cradle even more special. We have designed the walking to take in the best walking not to just have you on the Overland Track. The walks are also flexible allowing you to shorten them if need be. At 10:00am Overland Track Transport will transfer you from your Launceston hotel to Lake St Clair Lodge, collecting lunch on the way. In the morning if you have stayed overnight there is an option to walk Cataract Gorge in Launceston, but only if you have time. 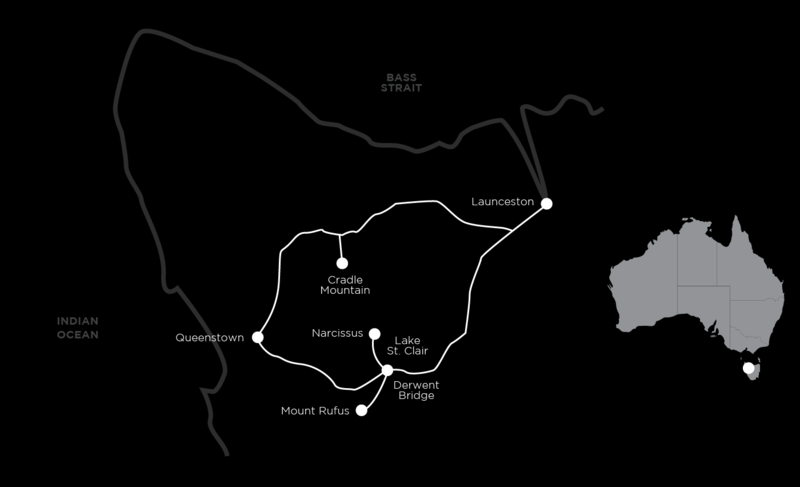 In the afternoon, we loop together three of Tasmania’s Great Short Walks. We start with the platypus walk, with the hopes of spotting one. We continue on the Aboriginal Cultural Walk and then onto Watersmeet Track. These walks are a fabulous introduction to the region and give you a small taste of what’s to come. There are two options offered today – the Shadow Lake circuit or the longer walk up to Mount Rufus via Shadow Lake. Pademelons, Antarctic Beech Forest (Myrtle Beech), Alpine moorland, pineapple grass, cushion plants, high alpine moorland, this is just the beginning of what you will see today. Among the highlights here are the magnificent views from the summit at Mount Rufus, a summit dominated by strange and fascinating rain-sculpted sandstone formations. The views extend all the way to Frenchman’s Cap and the head of the Franklin River. Today’s walk is a real adventure because not only do you get to be entertained with enlightened commentary as you are ferried out to Narcissus Bay on Lake St Clair, but you also get to walk the entire day on the south end of the Overland Track. This delightful walk takes us back along the lake to Cynthia Bay and the lodge. The walk starts out in an ancient rainforest, amongst a world of lichens and mosses. As the day progresses, we walk out of the Sassafras and Myrtle Beech and into the more open Sclerophyll forest dominated by black peppermint and other eucalypts. Today we leave Lake St Clair and travel to Cradle Mountain arriving in time to do some substantial walking. The first Cradle Mountain walk at Dove Lake with fabulous views of the lake and the mountain beyond is one of Australia’s iconic walks. The walk makes its way through a magnificent cool rainforest around the lake and right up close to the mountain. The boardwalk through Cradle Valley is a nice contrast to the first walk as we make our way to Ronnie Creek where you can take the opportunity to dip your feet in the crystal-clear mountain water. It is also undoubtedly one of the best places in Australia to spot wombats. It’s another iconic Cradle Mountain hike today, the Face Track Walk a world class, somewhat challenging walk, but the payoff is immense as awe inspiring views dominate virtually the whole journey. The walk begins in a pleasant gully of beech forest and small waterfalls and ascends to the alpine plateau via Crater Lake and a button grass moorland. At Kitchen Hut, beneath the summit is a magic place to take lunch and admire the view over the lake and the magnificent valley below. Here’s your chance to summit Cradle Mountain, however it requires scrambling, a head for heights and a high level of fitness, so it is not recommended unless you are strong and fit. We head home via the Face Track passing Lake Wilks while taking in the alternate magnificent views out towards the Walls of Jerusalem. If you wish, there are further options to continue walking. The walk through the valley up to Waldheims is a great area to spot wombats, native hens, echidnas and of course an opportunity to explore Waldheim Chalet. The walk at Enchanted Forrest is surreal, as you travel through a beautiful moss-covered rainforest featuring old King Billy Pines. We extend the day a little by taking the King Billy Track back to the hotel to be picked up and transported back to Launceston arriving at approximately 2pm. The terrain is mostly easy to navigate, with a couple days where the walks are long. On the Cradle Mountain walks, there are some rocky sections and involves scrambling over rocks. The walk is rated as moderate, with options to shorten on each day. Both Wilderness Lodge accommodations are truly excellent and are in or right on the national park and provide a welcoming and comfortable base to relax and recount the day’s highlights. All rooms have their own ensuite. The friendly locals we work with for accommodation, meals and transfers are attentive to your itinerary and eager to help make your departure and arrival each day as smooth as possible. All the meals are chef prepared by the in house lodge chefs. The dinners are all 2 course a la carte. The comprehensive cooked breakfasts are the perfect preparation for each days walk. There’s an emphasis on local produce and wine from the region. Each day whilst you’re walking you’ll be provided with a substantial walkers lunch and more importantly you’ll get to eat it at a fabulous location on the track. A walkers lunch is varied and may include a high protein type salad, roll or a wrap, muesli bar, cake or muffin and a piece of fruit. The holiday starts and finishes in Launceston. While the walking terrain is mostly easy to navigate, there are a couple of days where the walks are long. On one of the Cradle Mountain hikes there are some rocky sections and involves a very small amount of scrambling over rocks. There are other options this day. The walk is rated as moderate overall as there are options to shorten the walking on each day. We can recommend that you incorporate an extra day at Cradle Mountain to visit other tourist attractions, enjoy a spa treatment, tackle more of the fabulous walking or simply rest and relax. Summer is not the only time of year for hiking in Tasmania. Locals will tell you that November to May is suitable, but it’s Tasmania so you need to have the right clothing. See gear advice. If you have any questions about the Cradle Mountain walks or any other of the walks or logistics, feel free to ask one of our destination consultants or to speak with one of our guides. You can get in touch with us via our contact form, email us at info@auswalk.com.au, or call us on +61 3 9597 9767.